One of our recommended brokers, Redwood Options, has recently made some changes to their website. Redwood Options stands out from the morass of mediocre binary options sites in large part because they are always taking major strides forward and leaving their competitors in the dust. Now their website is easier to navigate and more feature-rich than ever. What have they changed and added? The site has a new and improved look. The Redwood Options website is more user-friendly than ever and easier to navigate. It looks and works great! The trade page has also been revisited. It is now easier to select different methods for trading binary options, and view the different possibilities all on one screen. You do not even have to leave the homepage to trade High/Low, Pairs, Long Term, One Touch, Ladder or 60 Seconds options. Ladder trades are now available. Ladder Options are a more complex kind of trade than High/Low Options. 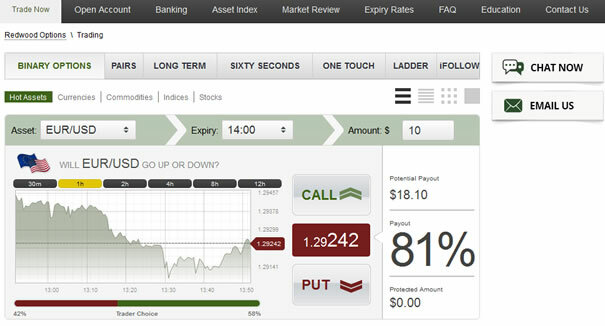 Not a whole lot of binary options brokers are offering Ladder trades yet, so it is very exciting that Redwood Options is doing so now. With Ladder Options, traders can pursue partial profits and reduce their risk. Not only that, but there is a chance to earn incredible payouts of up to 1500%! Not even One Touch trading offers that kind of profitability! The Market Analysis section of the website has been updated. Content will be refreshed more often and will be more visually appealing to traders. That will make it easier to keep up with the daily news and make smart trading decisions based on fundamental analysis. The Asset Index has also been improved; traders can now view all the assets alongside their logos. That way it is easier to see at a glance what financial instruments are available to trade. Redwood Options is powered by SpotOption and open to traders in the USA and around the world. They have a low minimum deposit of $200, and you can trade as little as $5 at a time. Bonuses of up to 100% are available on your first deposit. This is a legit broker with a lot to offer. If you are not familiar yet with Redwood Options, we strongly recommend you read our detailed review, and think about setting up an account with them. With their new and improved website, it will be a better trading experience than ever!